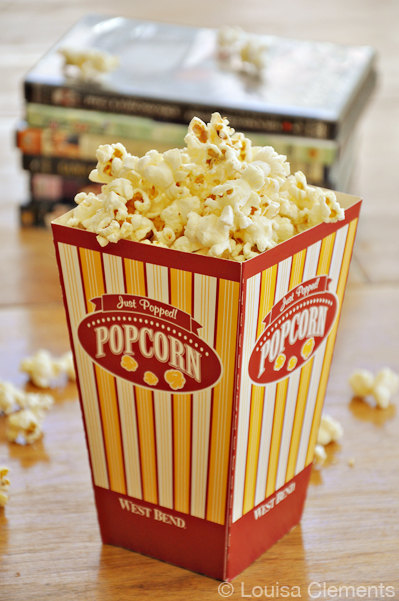 Add a touch of decadence to popcorn with this recipe for Parmesan Popcorn. A new popcorn recipe can only mean one thing; the Oscars are approaching. In other words, can you believe that there are only nine short days of February left?February is probably my least favourite month in the year; it’s cold, it’s busy and it’s just not really much fun. It’s one of those months where you have to take the fun into your own hands and make something out of the month. This can be hard when the weather is so cold and awful, for me it often involves having a stew cooking away in the slow cooker or a chicken roasting in the oven and taking in some award-winning television or film. Typically, this comes in the form of celebrating a year in some great, hilarious, sad and of course, terrible movies. This was just a fantastic year for film. There were some beautiful movies like Warhorse, highly anticipated, chapter-closing films like Harry Potter and the Deathly Hallows Part 2 as well as some wonderful performances like those in My Week with Marilyn, The Artist and The Help. We saw a year of entertaining films like Midnight in Paris and funny ones like Friends with Benefits. As always we had many rom-coms, some wonderful like Crazy Stupid Love and others were not so wonderful. Who can forget the amazing laugh-out-loud hilarious film that was Bridesmaids? How about all the action movies, Captain America, Thor and Transformers 3 to name a few. I think all in all 2011 wasn’t too bad for film! Standout favourites for me were definitely My Week with Marilyn and Midnight in Paris. I can see myself re-watching those movies many times in the years to come. We’ve finally reached the end of our countdown: less than a week to go until The Oscars! This is the final recipe that I will be serving at my party – you can’t have a party celebrating movies without popcorn. This popcorn is on the savoury side, topped with butter and Parmesan cheese means it’s a little decadent and so satisfying. I’m always looking for new ways to spice up popcorn since I watch so many movies. If you’re looking for other recipes to serve at your own Oscar party, make sure you have my seafood salad, avocado shrimp dip and punch (either alcoholic or non-alcoholic) on the menu. Sprinkle with Parmesan cheese and black pepper. Serve. Who else is planning an Oscar Party? I’d love to hear what’s on your menu and let me know if you make this Parmesan popcorn.